This Classic Cambodia Tour trip is perfect for those who have limited time and would like to experience the main highlights of Cambodia. 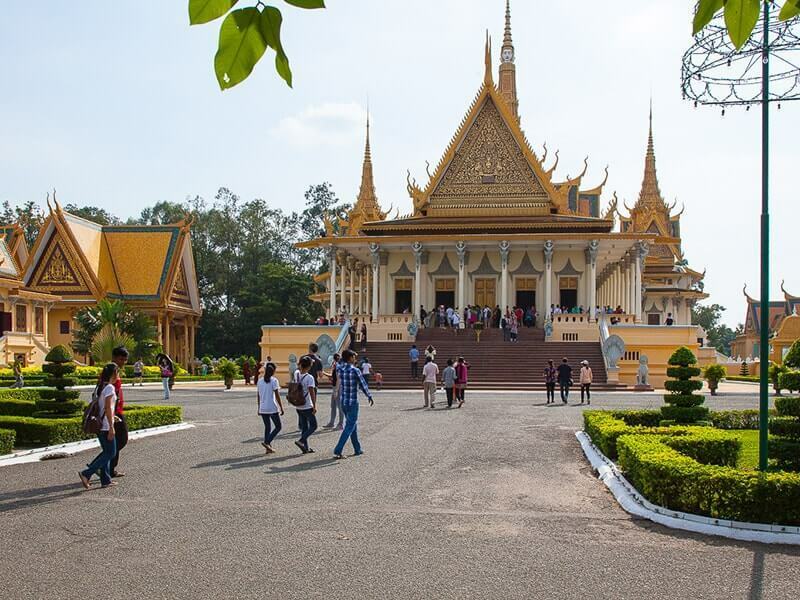 Start in the capital city of Phnom Penh, you will explore this vibrant city and its French colonial mansions, tree line boulevards and monumental Angkorian architectures. 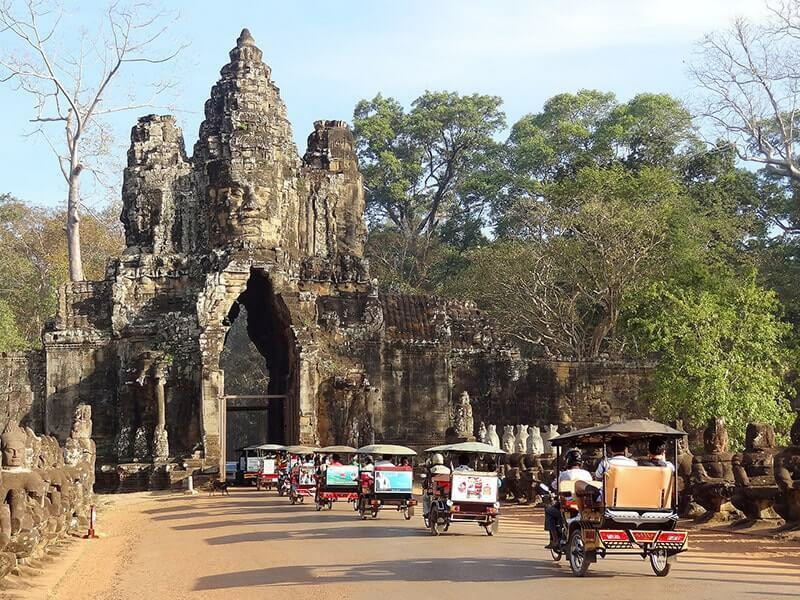 Then discover the magnificent temples of Angkor complex including Angkor Thom and Angkor Wat. We also take a visit to a floating village to see how people adapt to life on this unique ecosystem. It will be an unforgettable trip in your life! The capital of Phnom Penh locates at the confluence of three rivers, the mighty Mekong River, Bassac River and Tonle Sap River. It was once considered as the “Gem” of Indochina with a nice riverside promenade and numerous beautiful Cambodian Buddhist wats, palaces and many colonial-era buildings where Asian and Western architecture meet in a fascinating way. 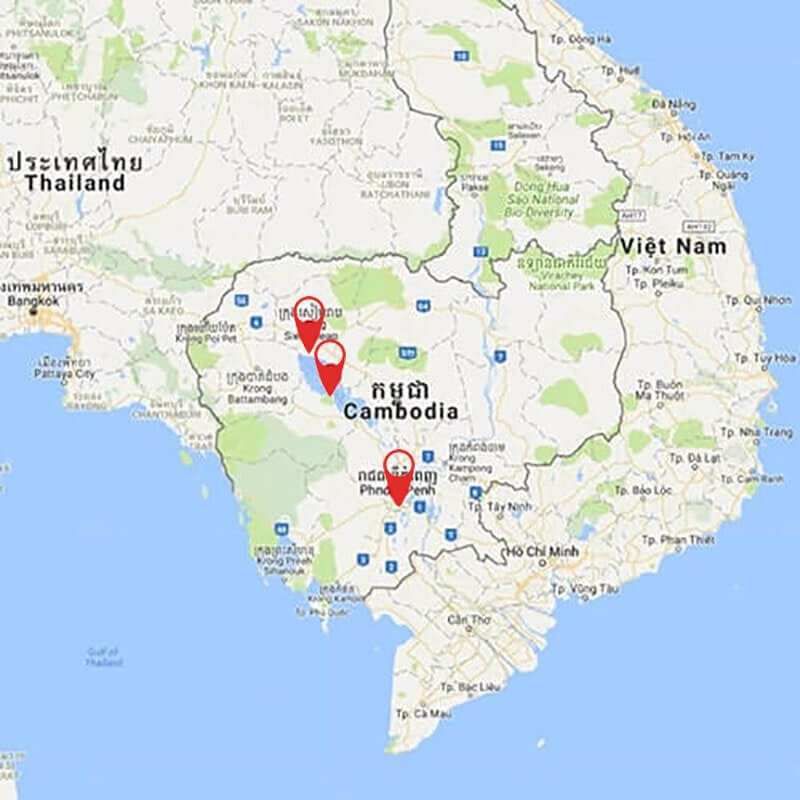 Upon arrival at the Phnom Penh Airport, you will be greeted by our local guide and driver then provided with a transfer to your hotel for check in. 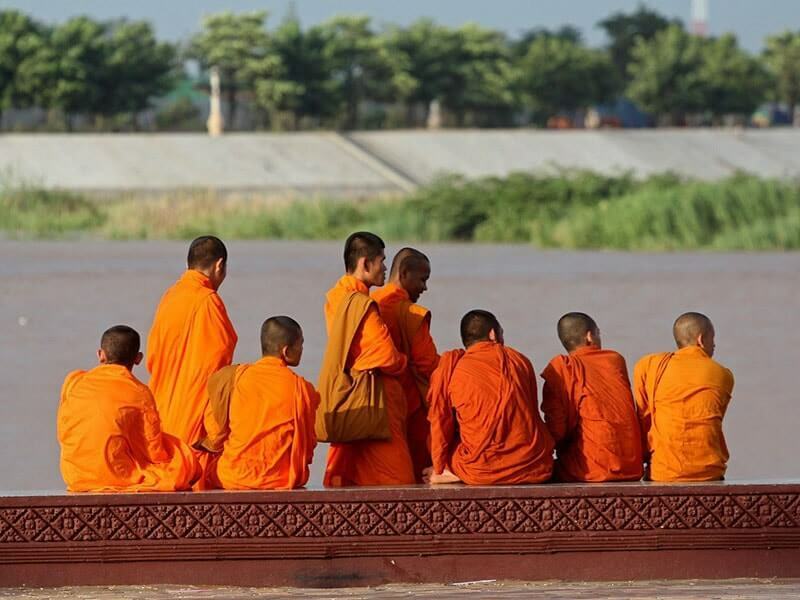 Embark on a sunset river cruise along the Mekong river. Observe daily life of local and the beautiful sunset view on the river before enjoying our welcomed dinner. This day, we will enjoy a full day sightseeing tour of Phnom Penh by cyclo (pedicab or bicycle rickshaw) which is a special way of experiencing the bustling streets in Phnom Penh. Start our tour with a visit to Wat Phnom (a Buddhist temple) which is the oldest religious structure in Phnom Penh. It was built in 1373 and stand 27m above the ground in city’s center. We continue with the National Museum of Cambodia which is house of the world’s finest collection of Khmer sculpture. 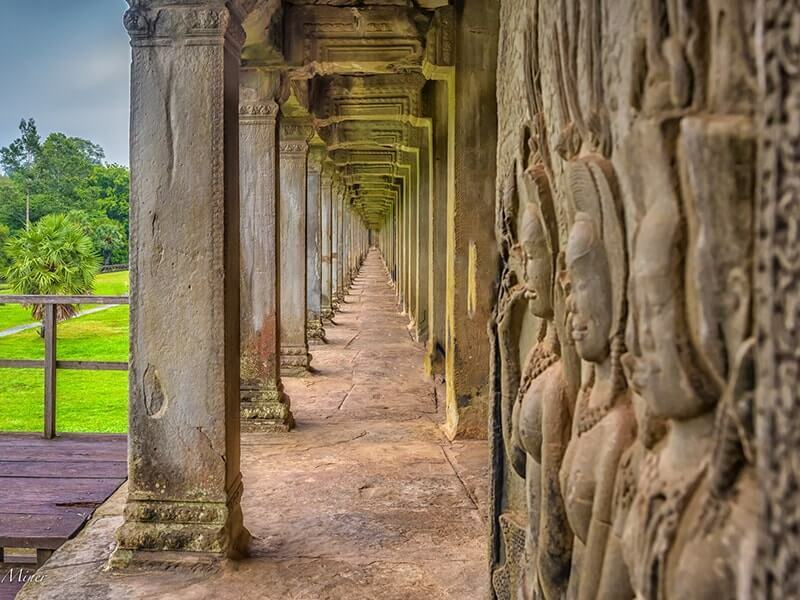 Here, you will have a glimpse into Cambodian history dating back from the 4th century to modern time. After that, we take a visit Royal Palace and Silver Pagoda which are the most popular tourist attractions in Cambodia. Inside Royal Palace complex, we will watch the collection of Buddhas in gold, silver, crystal, and bronze. 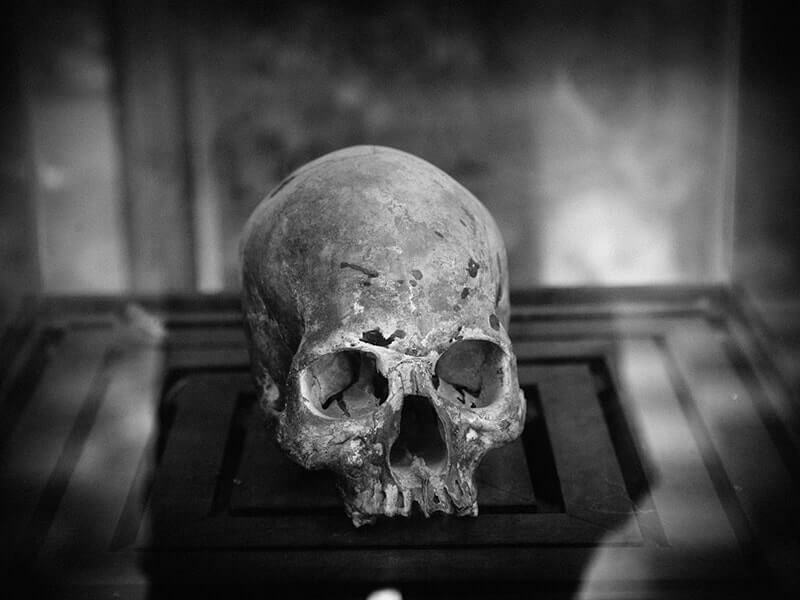 In the afternoon, we will take a visit to the remarkable Tuol Sleng Genocide Museum which is a former high school, used as the torture, interrogation and execution center named “S-21” by the Khmer Rouge from 1975 to its fall in 1979. A grim, but important visit that will allow you to dig below the surface and understand Cambodia better. 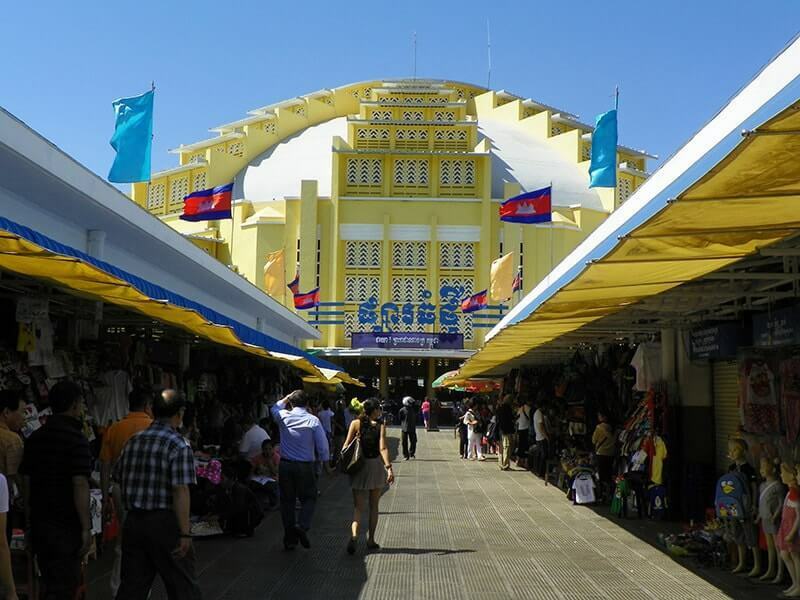 Afterwards, we will take a visit to Phsar Toul Tom Pong Market (Russian Market), one of most popular markets Phnom Penh where you could find everything from colorful lanterns, beautifully hand carved statues and handmade silk scarves to printed T-shirts and DVDs. On the way back to your hotel, we head to the riverside park. Walk along the riverside, observe the locals’ life. 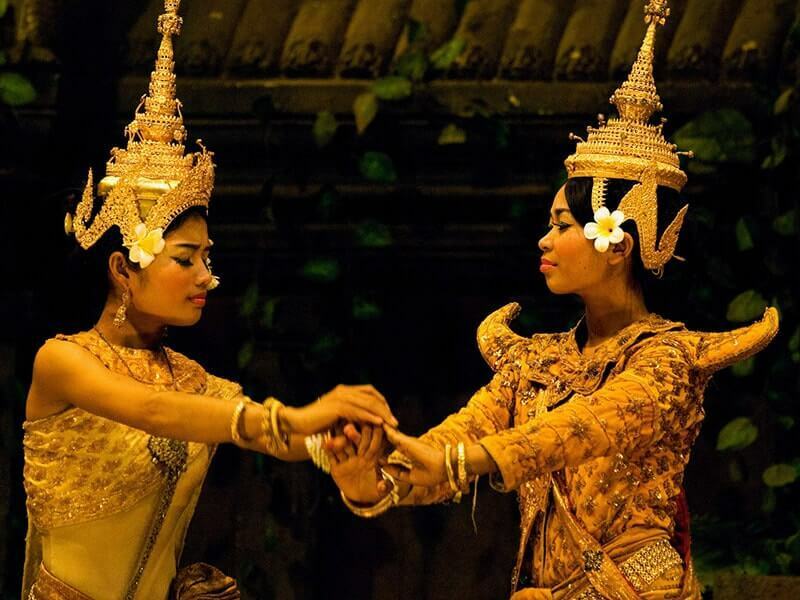 There is a chance to participate in a Khmer dance class which offers lots of fun! Today, you will catch a domestic flight to Siem Reap, gateway for the temples of Angkor. On arrival in Siem Reap airport, you will be welcomed by our local travel guide and transferred to the hotel for check in. We begin our sightseeing tour by visiting the Angkor National Museum for an introduction of Khmer civilization’s art and culture. This archaeological museum is housing unique collections which are mainly dated from Khmer Empire's Angkor period from the 9th - 14th centuries. Next we visit the mother of all temples – iconic Angkor Wat which was built in the early 12th century by the Khmer King Suryavarman II and was originally constructed as a Hindu temple to dedicate to god Vishnu. It was constructed following the model of the temple mountain symbolizing the Mount Meru, home of the gods. At the end of the 12th century, it was transformed into a Buddhist temple. Inside the temple, we will see the walls are covered with stone carvings and bas-reliefs depicting Hindu mythology, the wars Suryavarman II fought during his reign and more than 2000 images of Apsaras and Devatas decorating the temple. Wake up early this morning to watch the sunrise over Angkor Wat temples – one of the highlights of our Cambodia tour. Our guide and driver will pick you up around 5:30 AM at your hotel then take you to the best place to observe sunrise. It is worthy to watch the first sunlight shines over the largest archaeological site in the world. Return to your hotel then have breakfast or you may have it at a local restaurant (at your own account). This morning, we will drive out to visit the beautiful Banteay Srei Temple which is 25 km north-east of the Angkor main group temples. Banteay Srei means “Citadel of the Women”, it is the finest examples of classical Khmer art with wonderfully well preserved wall carvings and towers which are decorated with male and female divinities and beautiful filigree relief work. Along they way, we will stop at an exotic butterfly sanctuary and Preak Dak Village to interact with the villagers and learn about the way of life. This village also famous for its handmade souvenirs which are made of bamboo and rattan. Afterwards, we return to the Angkor Complex to explore the ancient city of Angkor Thom, was the last capital and most enduring of the Great Khmer Empire under the reign of Jayavarman VII. 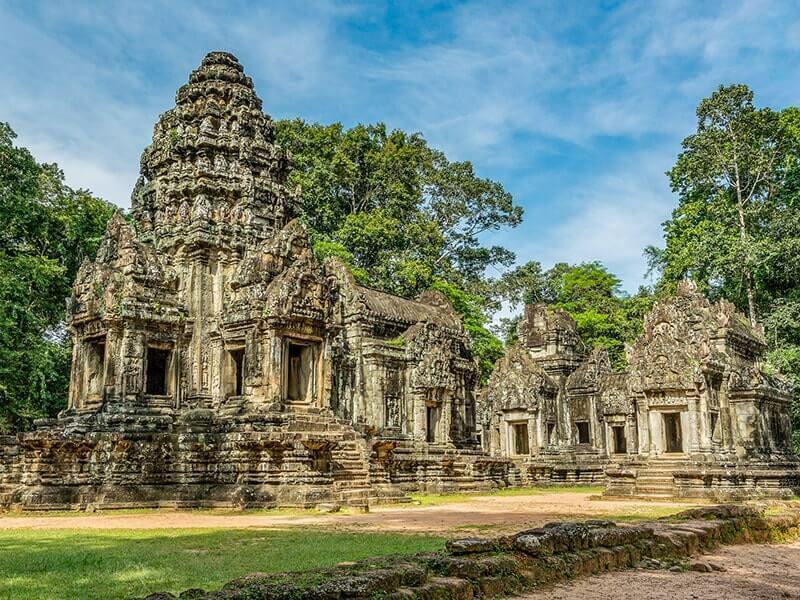 From the South Gate, an impressive stone gate carved with elephants and four giant faces, we head to the inspirational Bayon Temple which locates at the heart of Angkor Thom. This 12th century is well known for its impressive giant faces carvings and wonderful wall carvings telling the story of historical battles. After that, we take visit to the Terrace of the Elephants and the Terrace of the Leper King. It would be great experience to keep walking through the maze and observing their wonderful, fabulous, intricate sculptures. Then, we continue on to Ta Prohm Temple, built about late 12th century to early 13th century by the King Jayavarman VII. After that, we head to the pyramidal Temple of Pre Rup, enjoy the magnificent sunset view. Optional: You may be interested in watching the remarkable Phare, the Cambodian circus show. It is a NGO project which teaches disadvantaged children and teenagers living on the streets how to become circus artists. Enjoy music, acting, acrobatics and high-energy music in this show. Our guide will pick you up at hotel then take you a 20-minute drive from Siem Reap to a pier where you embark on a two-hour boat tour on the giant Tonle Sap Lake. Visit the floating village of Kampong Phluk, where houses, police station, community centre, school are built on water. Learn about local life and enjoy peaceful atmosphere in this village. On the way, we will pass floating houses and impressive flooded forests. Our guide will explain the history, flora and fauna and the villagers. After the boat trip, you will be transferred back to Siem Reap. The remain of the day is free at leisure. You could stroll around the central market, buy some souvenirs for your family and friends or indulge yourself at the lively Siem Reap night market's art deco pub and bars. You have visited all the highlights of Cambodia on this Classic Cambodia Tour. Free at leisure until our guide and driver transfer you to Siem Reap International Airport for your onward flight. 01 domestic flight Phnom Penh - Siem Reap. 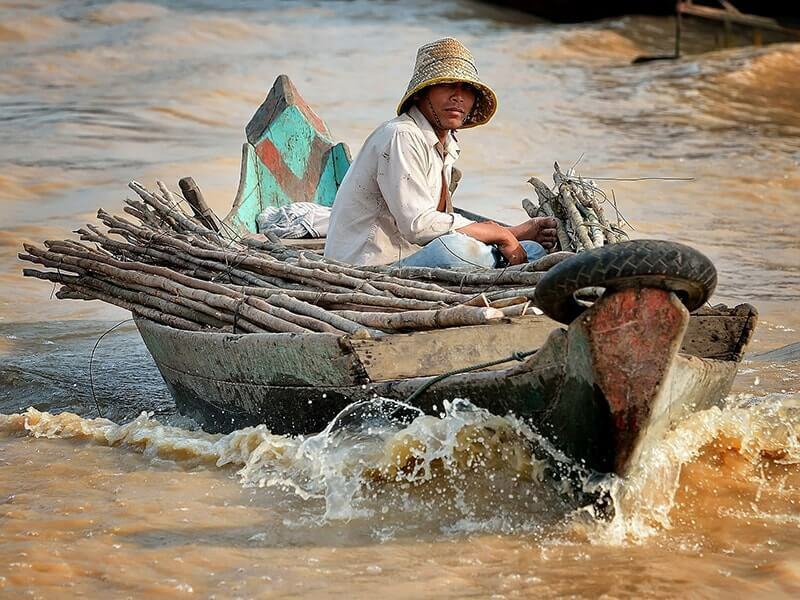 Boat in Tonle Sap (Siem Reap). 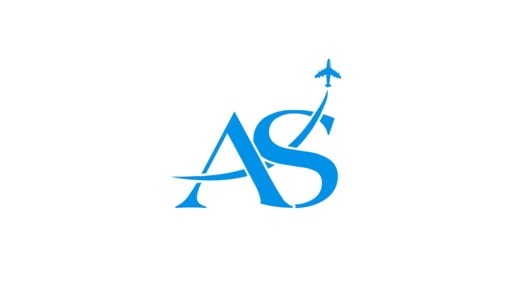 Other domestic and international flights.